Packet Row reminds me of The Speicherstadt where players are trying to fulfil contracts by obtaining goods from a common market. The contracts award players with gold which gives them flexibility to purchase other cards (goods / points / abilities). At the end of the game, gold is converted to points and the player with the most points is the winner. 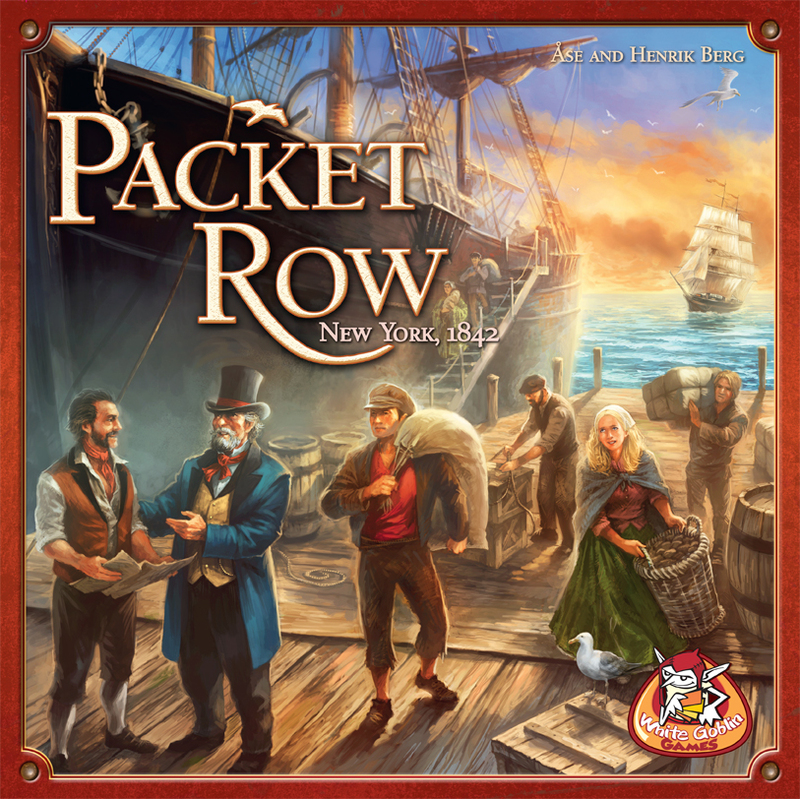 The interesting thing about Packet Row is how the player is able to select / buy a card from the market. Each round the first player (harbour master) selects one of four boards which are filled with various cards. And starting with the player on his/her left, they each have the choice to buy a card from the selected board. This means that the harbour master is the last to purchase a card. Each player may choose to pass and hope that the harbour master passes as well and selects a different board with the card they want. Once a player has purchased a card, he/she is out of the round. Should the harbour master pass, he/she gets to select another board and each player who hasnt purchased a card will then have the same choice of buying or passing. The round only ends when the harbour master has decided to buy a card on the selected board. If there were players that passed without buying a card and the harbour master subsequently decides to buy a card on his/her turn, then those players are considered to have missed out on purchasing a card that round. This mechanic seems interesting to me as it requires you to read your opponents to figure out what they may or may not want. Do you select a board that no one wants anything and then you buy a lower value card and thus they each have gotten nothing this round ? Or do you lure them away from what you want by selecting a board that has pretty tempting stuff so that they buy and stay out of the round and thus you can move to another board and buy what you really want ? I've not seen this mechanic implemented in any other games (not that i know of anyway), the closest I can think of is the I split you choose mechanic which i do like very much. I do have my fears though.. The cards dont have very much variety in effects and types. They are mostly ships, goods, and contracts. Very much like vanilla The Speicherstadt. And the cards are sorted by groups, so each board will always have the same group of cards that show up game after game. The setup and card allocation isnt random. PULP Episode 20: GENCON 2013 LAST DAY! A Purchase Decision - Sushi Go! Dominant Species : It's a BLOODBATH! City of Iron : so many resources ! Die macher : an oldie but a goodie! Fresco : better than pastiche ! Push Ur Luck Podcast is heading to GENCON 2013!